Responses brings together the readings and commentaries of literary critics and historians from the United States and Europe, with their diverse strategiesÃ¢ÂÂhistorical, rhetorical, psychological, political. The primary aims of these essays are reading de ManÃ¢ÂÂs texts, from 1940 to 1983, and assessing them in their political, ideological, and institutional fields. 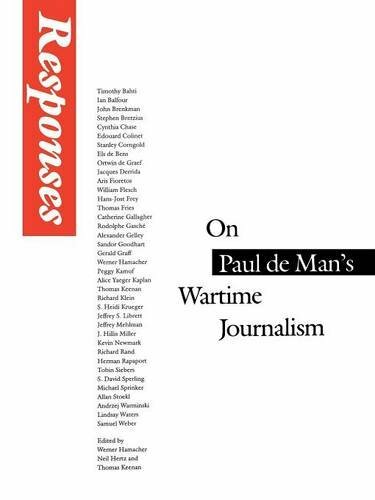 Responses also provides essential historical materialsÃ¢ÂÂletters, documents, personal recollectionsÃ¢ÂÂon Le Soir and Het Vlaamsche Land, on the occupation of Belgium, and on the biography of Paul de Man. An appendix collects the recent reactions of newspapers in the United States and Europe (France, Germany, Switzerland, Sweden, Belgium, and elsewhere) to the discovery of de ManÃ¢ÂÂs wartime writings. Contributors include Yves Bonnefoy, Cynthia Chase, Else de Bens, Ortwin de Graef, Jacques Derrida, Rodolphe Gasche, Gerald Graff, Barbara Johnson, Jeffrey Mehlman, J. Hillis Miller, Edward Said, Marc Shell, Gayatri Spivak, and others. The collection appears under the auspices of the Oxford Literary Review, EnglandÃ¢ÂÂs leading theoretical journal for over a decade.